In order to have a full view of psychedelics, those of us with a serious interest in this topic need to be realistic about psychedelics’ downside as well as their upside. While the mental heath “casualties” of misuse are well known and often exaggerated, we tend to focus on psychedelics’ benefits and ignore that they might also be used for undesirable political purposes by people whose motivations we disagree with, even abhor. 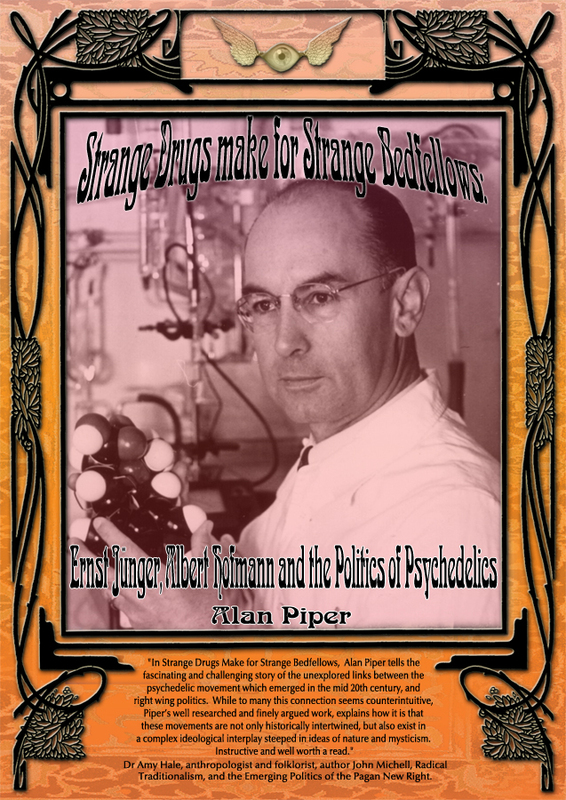 Like it or not, in Strange Bedfellows, Piper helps us rebalance our views to include links among early psychedelic pioneers such as Albert Hofmann and German novelist Ernst Jünger whose early writings supported Nazism; although they later disapproved of his later works. The link, according to Piper, was not primarily political; because Jünger had written about experiences that resembled Hofmann’s, he turned to Jünger for advice about them and even wrote a chapter in LSD: My Problem Child about Jünger. While most current psychedelicists and commentators about psychedelic trends often claim that psychedelics naturally lead people to take leftist political views and promote social care, Piper points out that those connections may arise from psychedelics illegal status. Illegality attracts people who are countercultural. The association between psychedelics and social concerns may be an accident of social history: by making psychedelics illegal, government policies give psychedelics a counter-cultural appeal to rebellious minds and revolutionaries. Pointing to an as-yet to be made political-social connection, the section “Psychedelics, Fascism and the ‘Cultic Milieu’” points to overlapping interests. The psychedelic literature about the supposed uses of psychedelics among Baltic and Nordic peoples can also appeal to pro-white, neo-Nazi, the pagan New Right, and similar groups. Piper does a service to psychedelia by alerting us to facts we’d just as soon ignore, and since one purpose of psychedelics is to expose the truth and follow it wherever it takes us, this applies not only to truths we like but also to those we’d rather not face. First acknowledging the magical transformative and humanistic qualities of these drugs, Alan Piper introduces the concept of “entryism,” and begins to reveal a shadow to the psychedelic movement, just in time for it to be addressed in expanding public discourse about these drugs. Robert Forte author and editor of Entheogens and the Future of Religion and Timothy Leary: Outside Looking In. page 1. I was particularly concerned that it [this paper] might be seen as an attack on Albert Hofmann, a venerated icon of the psychedelic community, in my relation to my treatment of his close relationship with the German conservative revolutionary author Ernst Jünger. In that respect, I have to point out that a close friendship does not mean shared views or ideologies, many friendships flourish on the basis of divergent or even opposing views. However, Albert Hofmann clearly did seek out Ernst Jünger when he needed guidance regarding the esoteric rather than the medical or scientific aspects of the psychedelic experience. page 6.